No main stem. Streams drain directly into Lake Champlain. The Grand Isle Basin is technically not a sub-basin, rather it is a convenient term used to describe the hydrology (the flow of water) on the islands. It includes streams draining directly into Lake Champlain and the islands of Grand Isle, North Hero and Isle La Motte. On the interactive map, Grand Isle Basin has been merged with Lake Champlain (direct) Basin. Lake Champlain (direct) Basin is those streams and tributaries that do not flow into a larger waterbody, but drain directly into Lake Champlain. 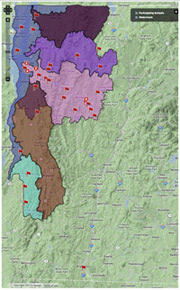 The streams and tributaries that make up the Lake Champlain (direct) Basin have small watershed boundaries. For the purpose of this interactive map the Lake Champlain Basin and Grand Isle Basin have been combined. At this time we do not have current drainage data for all of the direct streams and tributaries that are part of the Lake Champlain (direct) Basin.